This post is sponsored by Sabra. May 13th is National Hummus Day and they are celebrating! Follow them on Facebook and Instagram for great recipe ideas! For the incredibly small amount of work that goes into these sweet potato rounds, I find them to be beautiful. 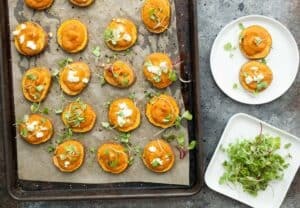 What I love about them is the sweet potato and hummus combo is very delicious with nothing else added, but if you want to build on it, you can add extras like goat cheese and maybe some spicy microgreens. So the rounds could be vegan and the minimal form has literally 5 ingredients including salt and pepper. But I couldn’t help myself and had to add some crumbled goat cheese to them. While I originally thought of these as an appetizer, which they most certainly are, they can also be a simple meal if you served them with some soup or something. They end up being hearty enough if you stack a few of them up! Whether meal or quick app though, they should definitely be in your recipe list! These beautiful apps are simple to make but have big flavors! Great for a party or pile them up for a quick unofficial meal! 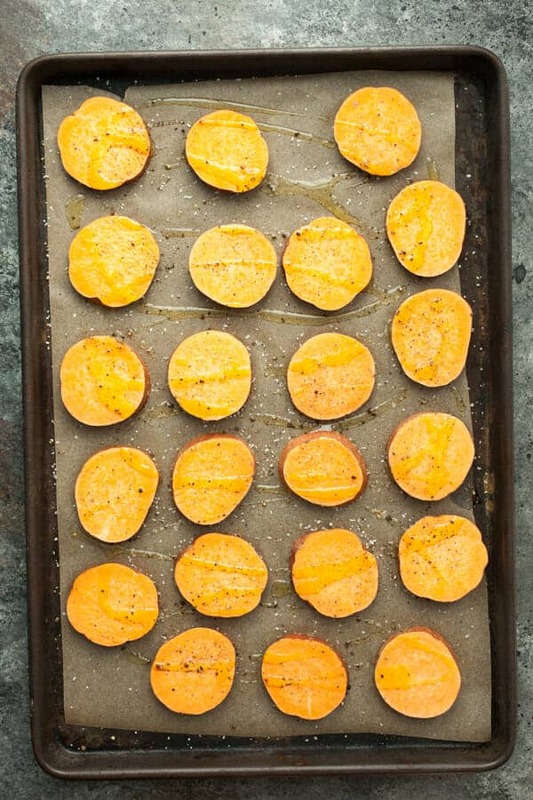 Place potato rounds on a baking sheet lined with parchment paper for easier clean up. Drizzle with olive oil and sprinkle with salt and pepper. Roast rounds for 15 minutes. 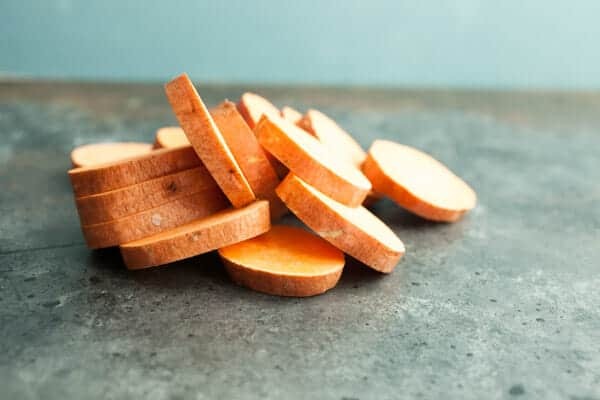 Remove sweet potato rounds. Then pipe on a dollop of hummus (either classic or roasted red pepper works well). I like to just use a plastic bag with the tip snipped off. Optionally, you can crumble on some goat cheese. 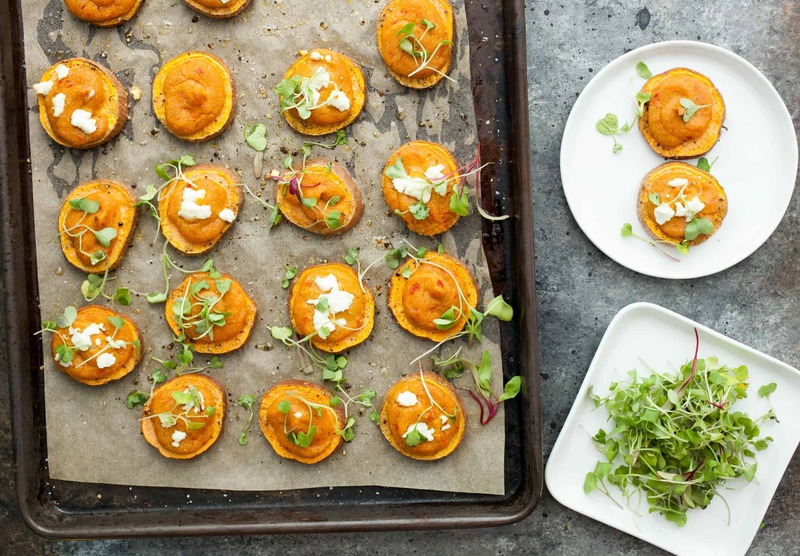 Remove rounds and garnish with microgreens (optional). Serve while warm, but they are also good at room temperature. 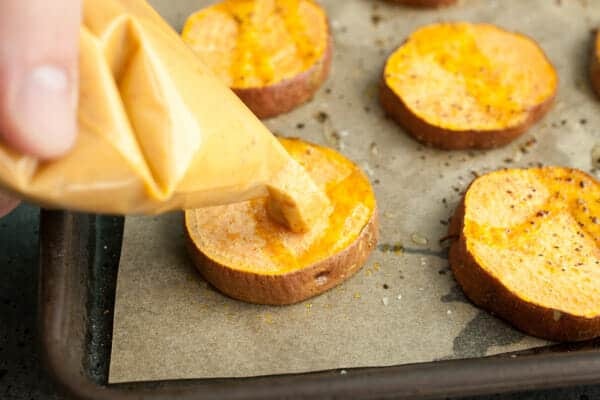 One thing I’d recommend when picking sweet potatoes for this recipe, try to find ones that are even thickness so your rounds end up being the same size. Try to slice them all about 1/4-inch thick. No need to measure or anything but if you get some that are much thicker, they won’t cook evenly. Crank up your oven to 400 degrees F. and lay them out on a baking sheet with a drizzle of olive oil and salt and pepper. I like to lay down some parchment paper as well for easier clean up. You might notice that I don’t even peel the sweet potatoes. Scrub them well and the skin is a great addition. It doesn’t get easier than this, people. Bake the rounds for about 15 minutes. Then pull them out of the oven and pipe on the hummus. Of course, you could just spoon some on, but I actually think it’s easier to get it on the round by scooping the hummus into a bag and piping it on. If you wanted to stop here, they will be great, but feel free to sprinkle on some cheese which goes well. I used goat cheese, but feta would work equally well I think. Add some cheese, or not! Bake for another 12-15 minutes and you’ll be in business. The rounds should be lightly browned and starting to crisp around the edges and the hummus should be slightly darker and almost cracked on top. When they come out I like to sprinkle them with a few microgreens before serving, but again that’s totally optional. I just like the bright green color against the orange rounds. 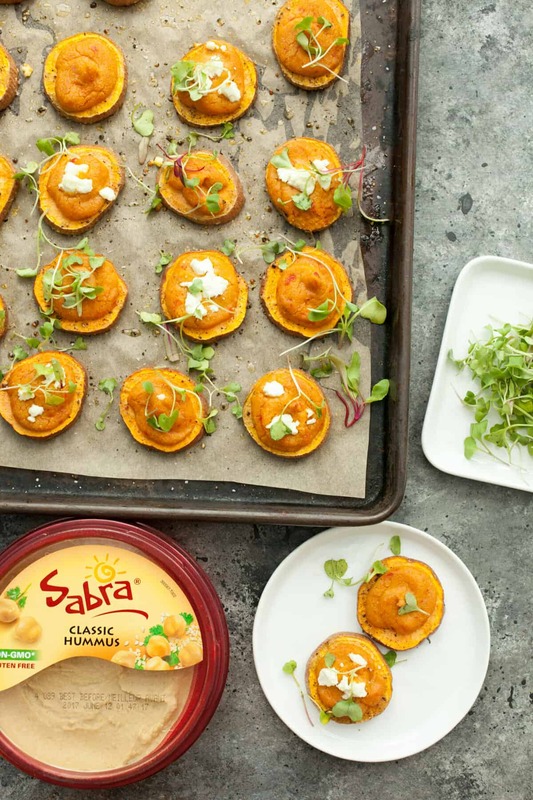 These hummus sweet potato rounds are healthy, easy to make, and completely delicious. What more could you ask for?! This looks so simple to do, and at around 45 minutes to do the whole cooking. It’s actually quite tempting. 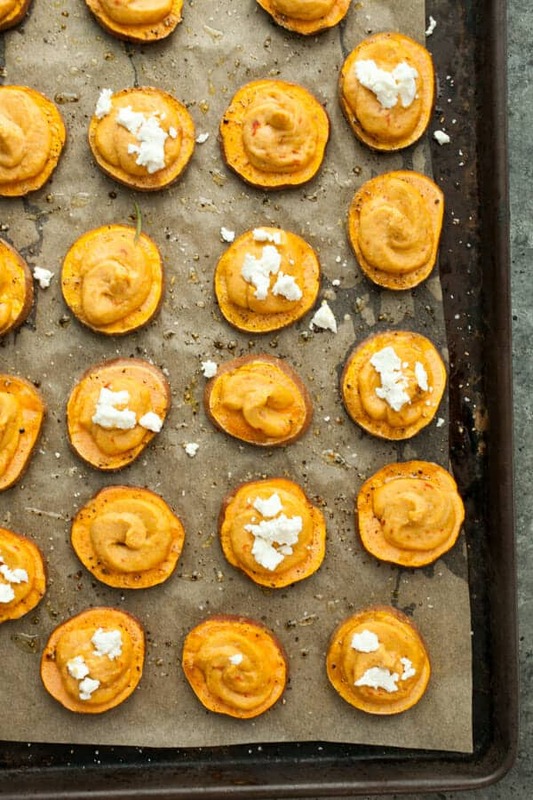 I love sweet potato, but never thought to mix it with hummus. This is great, the two things I love in one recipe. Will have to try it out. Thanks for the recipe! THanks Yuen! So glad you liked them!